A variety of ankle-foot orthoses are used. In the treatment of Achilles' tendon rupture, e.g., the orthosis holds the foot at a right angle to the horizontal plane of the body, in plantar flexion. A supportive device applied to the back (and often encircling the trunk) that limits the movement of the vertebrae, alleviates pain, or unloads mechanical stress; back brace. An orthotic that uses the muscles of the wrist, esp. the extensor muscles, to drive the fingers together into a grasping motion. It can be used by people with paralysis of the hand to improve the ability to hold on to and release objects. A dynamic splint used for functional grasp by people with C6 tetraplegia. See: tenodesis (2); universal cuff. Additionally, the AFO footplate heel end stiffness was measured by loading footplate at 15 mm point from the heel end edge (loading scheme Fig. 9 years; range 20 to 72 years) who had been analyzed under barefoot and AFO conditions during the same session were included in the study. The specific aims of this article were therefore to review studies in the literature regarding methods used to investigate AFO rigidity and to analyze and contrast the strengths and weaknesses of current techniques as well as published reliability and repeatability data. 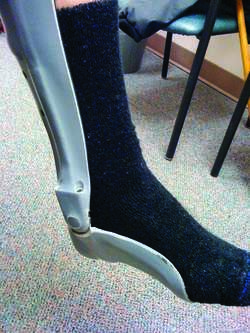 A solid AFO conforms to the shape of the calf and foot as one continuous plastic brace. Type of material items associated with the AFO model is Polyethylene PE-HWV, a special plastic material with follow characteristics (EN ISO 587): tensile modulus of elasticity E = 800 GPa, yield stress [[sigma]. El AFO es patrocinado por: Soulforce, Children of Lesbian and Gay Everywhere (COLAGE), National Black Justice Coalition (NBJC) y Universal Fellowship of Metropolitan Community Churches. The Call for Health Specialist contacted the prosthetics & orthotics company where Jose went to get a custom made molded AFO for his right foot. My quads are intact, and I was able to lose the AFO on my left leg. Unfortunately, he was heading out town for the AFO, so he wouldn't be able to see the carbon in action. This AFO product was chosen because "it consistently acted like a total contact cast in terms of providing optimal healing as well as optimal pressure offloading," said Dr. In the first 12 patients, peak plantar pressure is similar so far in the two groups, but the average daily step count is 1,800 in the AFO group, compared with 1,200 in the TCC group.